Our Boldest Freshness even in a COLD WASH. 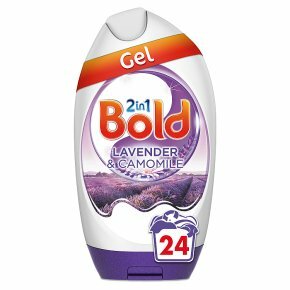 Bold 2in1 Washing Gel deeply clean your clothes for brilliant results. Irresistible scents, designed by Lenor Perfume Experts. For a natural & relaxing lavender scent. Stylish pack. Also available in washing powder, washing liquid & washing pods.Our Boldest Freshness even in a COLD WASH. There?s nothing like this Bold 2in1 Washing Gel to feel the pampering, relaxing feeling of a spa and that relaxing feeling of bathing salts between your toes. The scent of this variant will make you feel like a million bucks. Take your senses on a relaxing stroll thought fragrant fields of fresh Lavender and let your cares melt away. This timeless scent blends soothing Camomile, Warm Woods and soothing Manuka Honey notes for a blissful feeling of serenity and harmony. Bold 2in1 Washing Gel gets to work right at the heart of the wash. And if you really are crazy about scent, then we recommend trying Lenor Fabric Enhancers on top of your favourite Bold 2in1 Washing Gel. 24 washes based on 37ml per wash. Biological Laundry Detergent. Warning. Causes serious eye irritation. Keep out of reach of children. If in eyes: Rinse cautiously with water for several minutes. Remove contact lenses, if present and easy to do. Continue rinsing. If eye irritation persists: Get medical advice/attention. If swallowed: Call a poison center/doctor if you feel unwell. If medical advice is needed, have product container or label at hand. Contains 4-tert-Butylcyclohexyl Acetate, Linalool, Tetramethyl Acetyloctahydronaphthalenes. May produce an allergic reaction.